Summer may be ending soon but it's still hot here in Louisiana. To me, there is nothing better on a hot day than a refreshing glass of fresh squeezed Strawberry Lemonade. I have made this easy drink recipe many times for parties and it's always a hit! I have adapted it from a recipe by my favorite Southern Chef, Emeril Lagasse. Even though Strawberry Lemonade is a tasty treat, it is awfully sweet and uses a hefty 1 cup of sugar along with the sweet cut fruit. So I decided to make a change and sweeten it with Born Sweet® Zing™ Zero Calorie Stevia Sweetener instead of sugar. I swear y'all, it tastes just as delicious and sweet with a lot less calories! Want to know what’s AmaZING? The moment you find a perfect sweet taste without a funny aftertaste, and zero calories! 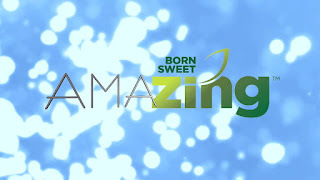 Enjoy the delicious sweetening experience of Zing™ Stevia Sweetener. Made with only real ingredients – nothing artificial, it has the perfect sweetness found in Mother Nature’s stevia plant. Sprinkle it into your coffee, teas, smoothies, over fruit and other favorite foods and beverages. 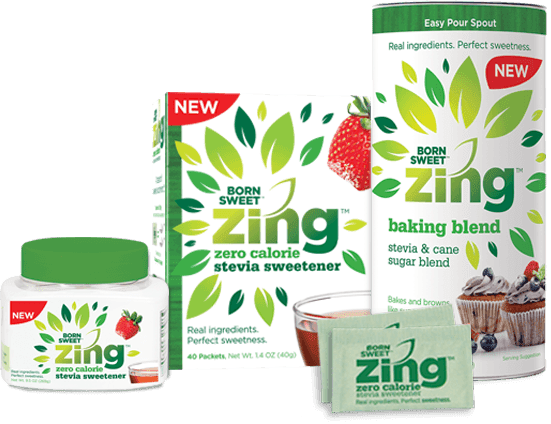 Zing™ Stevia Sweetener – a taste of sweet excitement! In a medium saucepan, bring the water and Zing™ Zero Calorie Stevia Sweetener to a boil. Reduce the heat and simmer, stirring occasionally, until the Zing™ Zero Calorie Stevia Sweetener dissolves. Add the lemon zest and lemon juice, stir, and remove from the heat. Let cool completely, then pour into a clean pitcher (strain if needed). In a blender or food processor, puree the pint of strawberries and add to the pitcher with the lemon juice. Stir well to combine and refrigerate until well chilled. Add the sparkling water and stir well. Recipe adapted from Chef Emeril Lagasse. 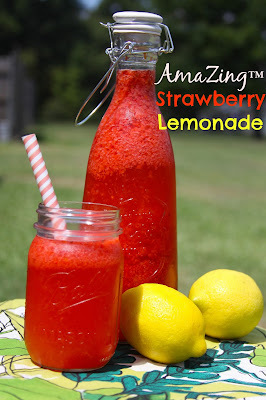 perfect addition to this refreshing summer drink! Fresh sweet strawberries all ready to puree! I opened and combined all the packets of Zing™ Zero Calorie Stevia Sweetener in a small bowl. It should be about 1 cup of sweetener. Zing™ Zero Calorie Stevia Sweetener to a boil. Slice and squeeze a bag of lemons until you have 1 cup fresh lemon juice. until the Zing™ Zero Calorie Stevia Sweetener dissolves. Zest a lemon and add to the saucepan. You should have about 1 tbsp. In a blender or food processor, puree the pint of strawberries. I could eat this with a spoon. Sweet pureed strawberries are a delicious treat! Mix together the lemon juice and strawberry puree. ADD ZING™ TO YOUR LIFE! Give your taste buds something new and amaZING to be excited about -- try new Zing™ Zero Calorie Stevia Sweetener for yourself! 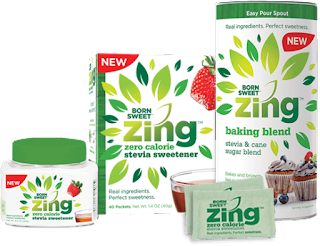 Get a Free Sample of Zing™ Zero Calorie Stevia Sweetener here. This summer drink is so refreshing. I love the thought of drinking something so good with fresh strawberries, without the worry of extra calories!! Thanks for sharing this recipe.